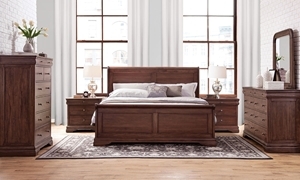 Bed with plank-effect head and footboards featuring contrasting arches, mirror and 7-drawer dresser in an antique grey finish. 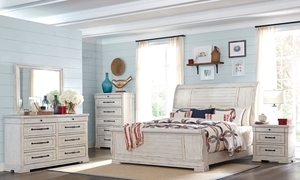 Twin suite includes bed with gently arched headboard and louvered insets, matching mirror and 6-drawer dresser in airy eggshell white. 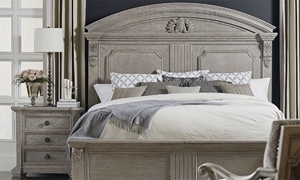 Poster bed with shaped upholstered headboard, matching mirror and breakfront dresser in a shabby-chic white finish. 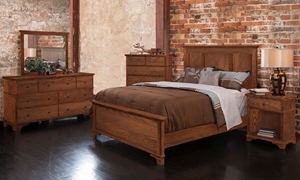 Suite features a storage bed inspired by traditional European structures, mirror and 6-drawer dresser with carved details. 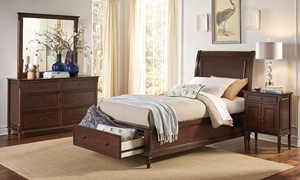 Sleigh bed with tufted headboard accompanied by a 9-drawer dresser and landscape mirror in a burnished coffee finish. 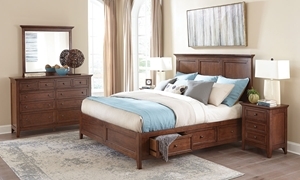 Polished twin bedroom suite features sleigh storage bed with roomy footboard drawer, plus dresser and mirror in a matching cherry finish.